DirectAccess is an IPv6 only solution, at least from the perspective of the client. 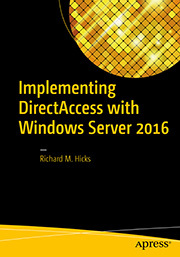 When the DirectAccess client is remote, it communicates with the DirectAccess server using IPv6 exclusively. 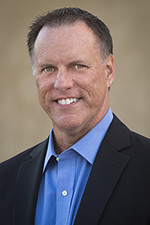 IPv6 transition technologies are used to enable this connectivity when the DirectAccess server and/or client are on the pubic IPv4 Internet. One of the IPv6 transition technologies used by DirectAccess is IP-HTTPS. With IP-HTTPS, IPv6 traffic is encapsulated in HTTP and delivered to the DirectAccess server using IPv4. IP-HTTPS is used exclusively when the DirectAccess server is located behind an edge firewall performing network address translation. To support IP-HTTPS, an SSL certificate is installed on each DirectAccess server. The SSL certificate is commonly issued by a public certification authority, but it can also be issued by an internal PKI. The SSL certificate used for IP-HTTPS can and does expire, and when it does it will prevent any DirectAccess connection from being established using this transition technology. When troubleshooting DirectAccess connectivity via IP-HTTPS, the first thing the administrator will notice is that the media state for the DirectAccess client’s IP-HTTPS tunnel adapter interface is shown as disconnected. In addition, the Get-NetIPHttpsState PowerShell command returns an error code 0x800b0101 indicating Failed to connect to the IP-HTTPS server; waiting to reconnect. Err.exe translates this error to CERT_E_EXPIRED, indicating that the SSL certificate is no longer valid. Viewing the IP-HTTPS SSL certificate is not possible using a web browser. Instead, use Nmap and the ssl-cert script to view the certificate. In the Operations Status window of the Remote Access Management console on the DirectAccess server, the IP-HTTPS status is listed as Critical. 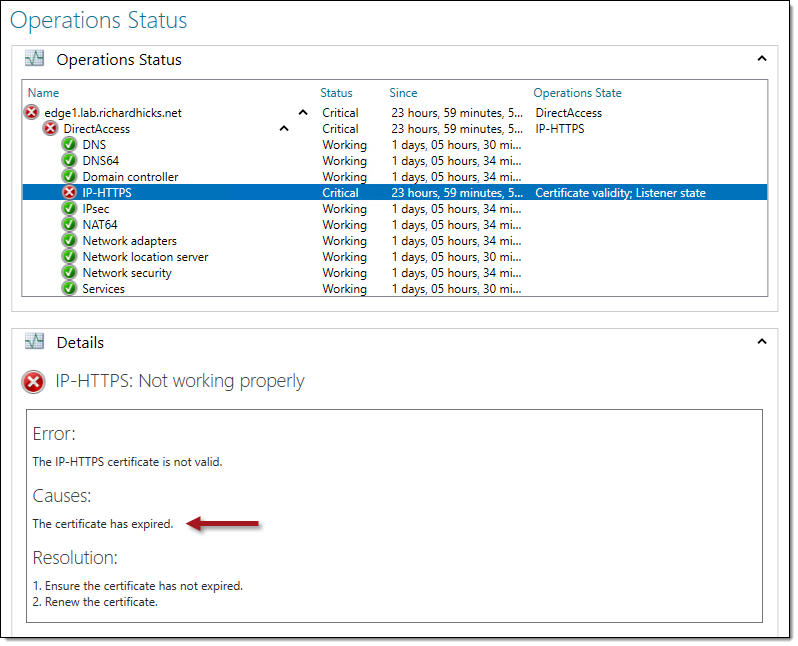 Details show IP-HTTPS not working properly, with an error stating the IP-HTTPS certificate is not valid, and clearly indicating that the certificate is expired. The IP-HTTPS status can also be viewed at the command line by issuing the following command in an elevated PowerShell command window. Simply renewing the SSL certificate is not sufficient to restore IP-HTTPS connectivity for remote DirectAccess clients. The DirectAccess configuration must also be updated to use the new certificate. In the Remote Access Management console, highlight DirectAccess and VPN under Configuration and then click Edit on Step 2 (for load-balanced or multisite DirectAccess deployments, first highlight the individual server and then click Configure Server Settings). Click Network Adapters, click Browse, and then select the new SSL certificate. Click Ok, Next, and then Finish twice and Apply. Repeat these steps for each server in the load-balanced cluster, and for all servers in all entry points in the enterprise. Alternatively, the IP-HTTPS certificate can be updated in the DirectAccess configuration by opening an elevated PowerShell command window and entering the following commands. Important Note: Be sure to execute these commands on each DirectAccess server in the load-balanced cluster, and for all servers in all entry points in the enterprise. When DirectAccess is deployed using the Getting Started Wizard (GSW), also known as a “simplified deployment“, a self-signed certificate is used for IP-HTTPS. By default, this certificate expires 5 years after it is created. The expiration of a self-signed certificate presentsa unique challenge. Although the self-signed certificate can’t be renewed, it can be re-created or cloned using the New-SelfSignedCertificate PowerShell command. However, DirectAccess clients will not trust this new certificate until they receive the updated client settings via group policy. 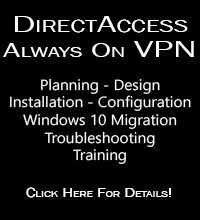 DirectAccess clients outside the network will not be able to establish IP-HTTPS connections until they receive these new policies. When they attempt to connect to the DirectAccess server without first updating group policy, the IP-HTTPS status will indicate an error code 0x800b0109 which translates to CERT_E_UNTRUSTEDROOT. If the expired self-signed certificate is replaced with another self-signed certificate (not recommended), DirectAccess clients will have to come back to the internal network or connect remotely via client-based VPN to update group policy and receive the new DirectAccess client settings. A better alternative is to replace the expired self-signed certificate with a public SSL certificate that matches the existing public hostname. This will allow remote clients to reestablish DirectAccess connectivity without the need to udpate group policy first. Certificate expiration must be monitored closely to ensure the highest level of availability for the DirectAccess remote access solution. Certificate auto enrollment can be leveraged to ensure that IPsec certificates are automatically renewed prior to expiration. However, the IP-HTTPS certificate must be renewed manually and requires additional configuration after it has been updated. 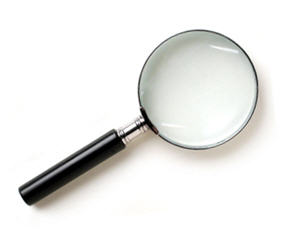 When troubleshooting DirectAccess connectivity issues, the popular Nmap network mapping and discovery tool is an invaluable resource for verifying the communication path to the DirectAccess server from outside the network. However, just verifying that ports are open and listening often isn’t sufficient. In the case of IP-HTTPS, for example, the tried and true method of using telnet to verify that the port is open might be misleading. For instance, telnet might indicate that TCP port 443 is open and responding, but DirectAccess connectivity can still fail. This often happens as a result of a network configuration error that allows another network device other than the DirectAccess server to respond to HTTPS requests, which results in a false positive. In an effort to conclusively determine that the DirectAccess server is responding, I’ve often relied on the SSL Labs Server Test site. Here I will enter the DirectAccess server’s public hostname and run the test, and from the results I can easily determine if indeed the DirectAccess server is responding by verifying that the HTTP server signature is Microsoft-HTTPAPI/2.0. This usually works well, but it takes a few minutes to run the test, and there are a few scenarios in which it doesn’t work. For example, I might be working with a customer to perform some initial testing by using a local HOSTS file entry for the public name before the DNS record has been created. Also, if the SSL certificate on the DirectAccess server uses an IP address instead of a hostname (not recommended, but it is supported!) the SSL Labs server test won’t work. 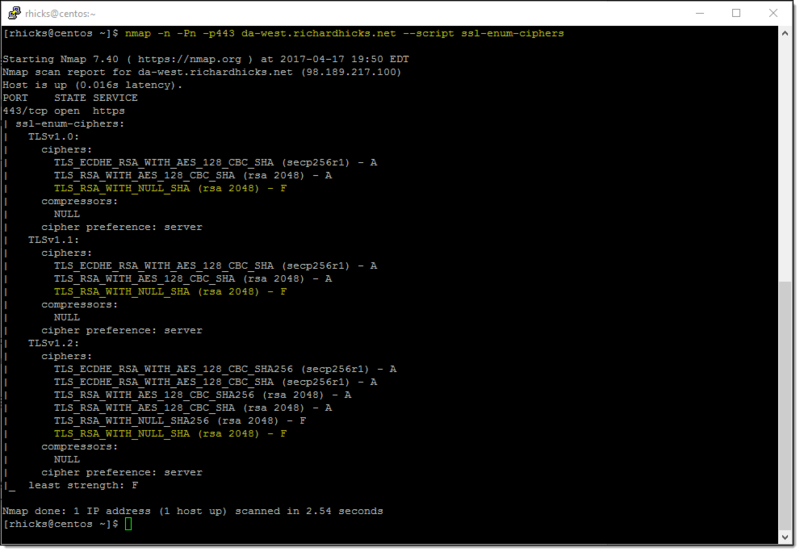 Now it is possible, using just Nmap, to not only determine if the IP-HTTPS communication path is functioning, but to definitively determine that the DirectAccess server is the device responding.